Synthetic peptide (the amino acid sequence is considered to be commercially sensitive) within Human ERp29 aa 200 to the C-terminus (Cysteine residue). The exact sequence is proprietary. Our Abpromise guarantee covers the use of ab175193 in the following tested applications. WB 1/1000 - 1/10000. Predicted molecular weight: 29 kDa. Proper protein folding and post-translational modifications are essential for secretory protein export out of the endoplasmic reticulum. This task is accomplished by chaperone proteins such as protein disulfide isomerase (PDI), GRP94, and BiP. A recently characterized protein, designated ERp29, is closely related to these chaperone proteins and appears to be upregulated during ER stress conditions. ERp29 is a soluble 259-residue protein that is localized to the lumen of the endoplasmic reticulum in all mammalian cells. Research has shown that there are two primary domains within ERp29. The first is the C-terminal region that is a novel, all helical, fold that is most likely involved with ERp29 retention to the ER. The second is the N-terminal region that resembles that of PDI’s thioredoxin module. 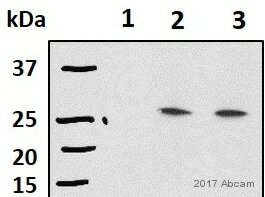 The protein shows sequence similarity to the protein disulfide isomerase family. However, it lacks the thioredoxin motif characteristic of this family, suggesting that this protein does not function as a disulfide isomerase. The protein dimerizes and is thought to play a role in the processing of secretory proteins within the ER. Immunohistochemical analysis of paraffin-embedded Human kidney tissue labeling ERp29 with ab175193 at a 1/50 dilution. Immunohistochemical analysis of paraffin-embedded Human thyroid gland tissue labeling ERp29 with ab175193 at a 1/50 dilution. Immunofluorescence analysis of MCF7 cells labeling ERp29 with ab175193 at a 1/50 dilution (red) and DAPI nuclear staining (blue). ab175193 has not yet been referenced specifically in any publications. Publishing research using ab175193? Please let us know so that we can cite the reference in this datasheet.